Guardians of the Galaxy is not a superhero movie. Yes, it's a part of the Marvel Cinematic Universe. Yes, characters cross over to the Avengers franchise. And yes, it's got the budget and advertising push of a Marvel superhero movie. But Guardians of the Galaxy is actually a throwback, pulpy science-fiction flick. Oh yeah; it's also a comedy. The titular Guardians are a ragtag, five-pronged crew of interstellar outcasts tasked with stopping Ronan the Accuser (Lee Pace), a rogue zealot of the Kree alien species bent on planetary destruction with the aid of future Avengers foe Thanos. The Guardians are led (or rather wrangled) by Peter Quill (Chris Pratt), a cocky, wisecracking treasure hunter from Earth who likes to go by Star-Lord (though no one else is on board with this nickname). He's joined by two mercenaries: Gamora (Zoe Saldana), a green-skinned Zen-Whoberi, and Drax the Destroyer (WWE wrestler Dave Bautista), a musclebound criminal who only communicates in literal speech. 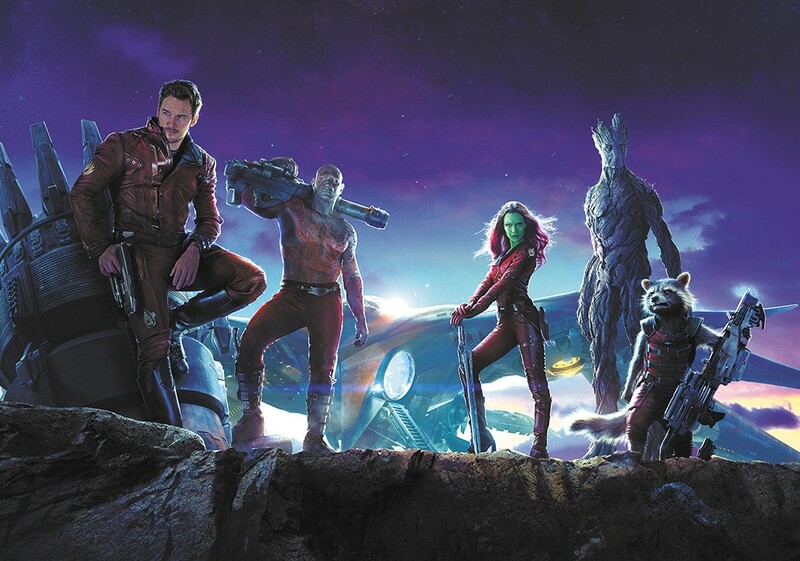 The team is rounded out by the CGI bounty-hunting team of Rocket Raccoon (voiced by Bradley Cooper), a quick-talking, genetically modified creature, and his muscle/sidekick Groot (voiced by Vin Diesel), a humanoid tree who can only say "I am Groot." The comedy has writer/director James Gunn's (Slither, Super) fingerprints all over it, for better and for worse. He revels in weirdness, continually swings big with his ideas and takes the strikeouts that accompany this style. His directorial voice is much more at the forefront than in the Avengers-based Marvel films. While there's plenty of action throughout Guardians — from prison breaks to spaceship dogfights — the comedy is the constant thread throughout the movie. Sometimes the jokes hit, but there are also plenty of whiffs (like Quill bragging about alien hookups). The kitschy soundtrack tries playing for laughs with tracks like "Come and Get Your Love," but it's actually more effective when played as straight character development for Quill (as it's all that remains from his Earth days). Thanks to Gunn's rapid-fire approach with both humor and action, there's no dwelling on the misfires. Guardians of the Galaxy, Guardians of the Galaxy 3D and Guardians of the Galaxy: An IMAX 3D Experience are not showing in any theaters in the area. Take a look at the movies opening this week.